I don’t know what I would have done if I had been one of the shepherds. Angelic chorus. Voices from heaven. The glory of God. Knowing me, I would have sought some reasonable explanation. Like you I live in the twenty-first century. No angels have come flapping by. No voice from heaven. Indeed, I wonder if they would have admitted me to seminary, prepared me to lead a church, if I had claimed anything like what happened to the shepherds. All I know is that I would attempt to hold onto the reality I know. The world of cause and effect. The science of replication. I do know I would have put down the wine skin! A first century Palestinian might have sought to obey more than understand. They lived in a world more alive with mystery, with forces unknown. So the story says they were afraid. Duh! You’d have to psychotic not to be afraid. The forces of heaven have ripped through the veil of our distractions. Here. Before them stands the mystery of the universe and the One who made it. Afraid? I would hope so. As for me, who knows. 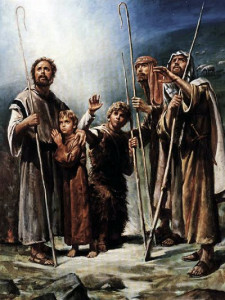 How many of you would believe me if I came to you with the same story as the shepherds? I’m a minister. I’m supposed to deal with angels, mystery and all the rest. But would you believe me? I dare say that if you are like most churches, you’d call the Vermont Conference of the United Church of Christ and they would start to worry that one of their churches is being served by a nut-job. So, I am willing to say tonight that I can’t relate to the shepherds. Their experience has not been mine. But who is to say that God will come again using the same method of revelation? Maybe God will come without the angels. Maybe I don’t have to be like a shepherd and deny my era, throw away my science. Maybe, like Elijah, it will be a still small voice. No roaring thunder or quaking earth, but in some third world country far from a maternity ward. Oh, that I could believe. But if we do not share the same historical sphere as the shepherds, if we cannot help but come with twenty-first century questions, we do share something. Like the shepherds, we, too, must go home. Home to the dishes, the laundry, the bills, the worry. Home. Oh, the text is silent about the long-term impact all this had on the shepherds. We do know that they went home glorifying and praising God. I wont. I hope to leave with a joyous heart, with a warm memory of the sanctuary lit with candles – the pleasant music still dancing in my head. But I wont go running up and down Bradford glorifying and praising God. First, I’d be arrested. Second, there would be a phyc. eval. in my immediate future. Third, you good folks would terminate my services. No, I wont go home in that fashion. No angel. No heavenly chorus. No star burning with its penetrating light. Home we go and I would offer you this. Perhaps God has come in a far more subtle way. Perhaps you know God’s essence more than you think. Home you go to those who know you best and love you most. Home. Perhaps in the love of others God has sung the chorus and visited us all. Perhaps we see in the love we have for each other a burning star. In those days a decree went out from Emperor Augustus that all the world should be registered. 2 This was the first registration and was taken while Quirinius was governor of Syria. 3 All went to their own towns to be registered. 4 Joseph also went from the town of Nazareth in Galilee to Judea, to the city of David called Bethlehem, because he was descended from the house and family of David. 5 He went to be registered with Mary, to whom he was engaged and who was expecting a child. 6While they were there, the time came for her to deliver her child. 7 And she gave birth to her firstborn son and wrapped him in bands of cloth, and laid him in a manger, because there was no place for them in the inn. 8 In that region there were shepherds living in the fields, keeping watch over their flock by night. 9 Then an angel of the Lord stood before them, and the glory of the Lord shone around them, and they were terrified. 10 But the angel said to them, “Do not be afraid; for see—I am bringing you good news of great joy for all the people: 11 to you is born this day in the city of David a Savior, who is the Messiah, the Lord. 12 This will be a sign for you: you will find a child wrapped in bands of cloth and lying in a manger.” 13 And suddenly there was with the angel a multitude of the heavenly host, praising God and saying, 14 “Glory to God in the highest heaven, and on earth peace among those whom he favors!” 15 When the angels had left them and gone into heaven, the shepherds said to one another, “Let us go now to Bethlehem and see this thing that has taken place, which the Lord has made known to us.” 16 So they went with haste and found Mary and Joseph, and the child lying in the manger. 17 When they saw this, they made known what had been told them about this child; 18 and all who heard it were amazed at what the shepherds told them. 19 But Mary treasured all these words and pondered them in her heart. 20 The shepherds returned, glorifying and praising God for all they had heard and seen, as it had been told them. I don’t know what I would have done if I had been one of the shepherds. Angelic chorus. Voices from heaven. The glory of God. I don’t know. Knowing me, I would have sought some reasonable explanation. Like you I live in the twenty-first century. No angles have come flapping by. No voice from heaven. Indeed, I wonder if they would have admitted me to seminary, prepared me to lead a church, if I had claimed anything like what happened to the shepherds. All I know is that I would attempt to hold onto the reality I know. The world of cause and effect. The science of replication. I do know I would have put down the wine skin!